Perhaps I’m showing my age, but I remember when Smith Street in Collingwood was so dodgy no one would actually go there for social events. Catching the 86 tram which goes up that road all the way to Bundoora was a bit of an ordeal, as you skilfully avoided the dipsomaniacs, junkies and homeless riff-raff who would get a bit tetchy if you offered them food and not money (yeah, beggars can be choosers after all). In the last few years, I do find myself hanging out on Smith St more often to grab a good bite to eat. 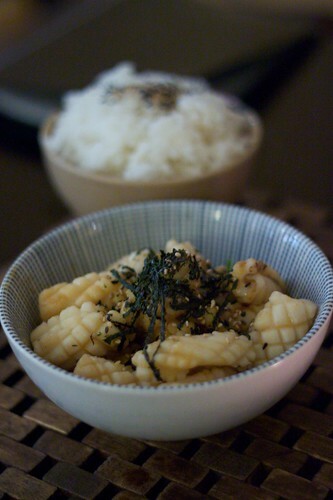 One such place I recommend is the cosy Japanese restaurant Peko Peko. Because it is small, it’s highly advisable to book if you plan to eat there, and that’s exactly what I did on my last outing there. I’m trying to eat less meat so I started with a serving of their sweet potato gyoza. As with another Japanese fave of mine Otsumami, the menu is divided into small, medium and large foods. 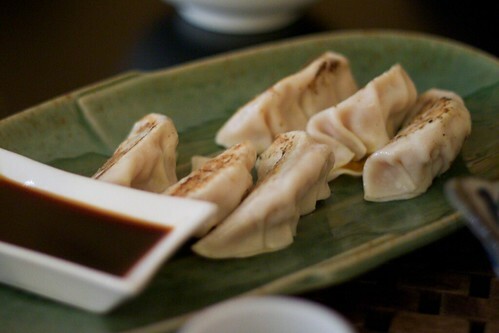 Gyoza is from the small foods menu. Peko Peko’s sweet potato gyoza is dessert-sweet and the skins are slightly chewy and not at all oily. Quite simply, they are perfect! You can see in the photo, how lightly pan-fried they are. I had the lovely company of my partner as I felt it was about time to spoil him (as he spoils me constantly). I insisted he order the tsuke maguro which is finely chopped tuna sashimi marinated in all sorts of wonderful Japanese goodness – soy, mirin, sesame and shredded nori. This is expensive for its portion size but well worth it. You don’t really need the additional wasabi given because I find that deflects from the subtlety of the dish. The tuna is always so fresh. Seriously, if you go here, I strongly recommend ordering this if your diet will allow you. For mains, we continued with the no-meat theme. I had the sashimidon (I’m really fond of them in general). 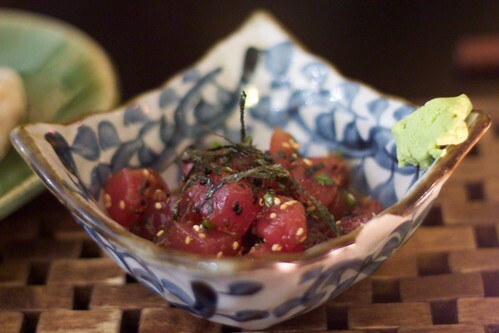 The marinated sashimi on top is similar to the tsuke maguro. My partner remarked that the serving of raw fish seemed a little stingy, and I have to agree, though it was delicious. The rice was nice and vinegary – normally I struggle to finish large serves of rice but it was just so good. 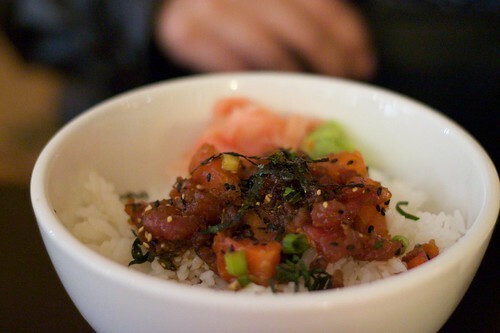 I have to learn to flavour my rice like they do for raw fish donburi. The better half ordered the seared squid with a side of rice. I wish all places that offer squid could cook it this wonderfully. It wasn’t at all rubbery or chewy. Bliss! While we dined and filled ourselves with food and flasks of warm sake, a steady stream of folks came in for takeaway. I could only dream of being local enough to have this as a takeaway joint! We skipped dessert but only because I had the intention of further wooing my partner at the nearby Cafe Rosamond for Pierre Roelofs’ sumptuous dessert night. This entry was posted in eatie-foodies dining out and tagged Collingwood, Japanese food, Melbourne, Peko Peko on May 26, 2010 by gem. Mmm, this looks quite delightful! I’ve been quite surprised at the number of Japanese places that have popped up along Smith st and even more appalled that I haven’t found the time to try them out! The servings look quite small in your pictures though, but I suppose that works since you spoilt yourself on dessert later!